One article I have been meaning to blog about is this profile of economist Kevin Murphy in the Nov/Dec 2006 issue of University of Chicago Magazine. Murphy has an impressive list of accomplishments, including the John Bates Clark Medal of the American Economic Association, which is given once every two years for the most outstanding American economist under age 40 (1997), and a MacArthur Foundation "genius grant" (2005). As a shy but affable 25-year-old grad student, Murphy confessed to [his advisor] Topel that his goal at that stage in life was “to become the world’s best coauthor.” By the time he was 35, he was there. Wow, that is quite a testament to collaboration. 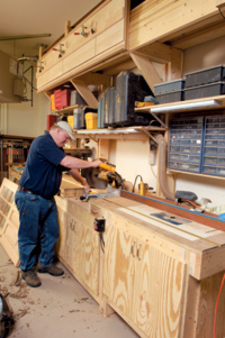 To the right is a picture of Murphy, who is an avid woodworker, in his workshop at home. Apparently, it is impossible to locate a picture of Murphy without his signature baseball cap.